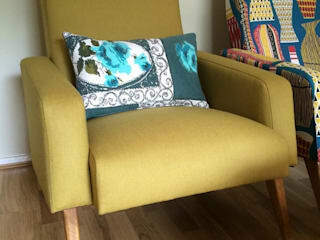 Eclectic Chair is Leeds based designer and upholsterer, Heather Linnitt's creative upholstery studio. 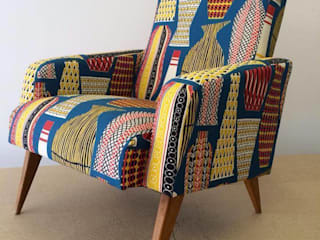 A unique collection of specially designed furniture, featuring Vintage, Mid Century Modern and Antique pieces, reupholstered with an eclectic and inspiring variety of textiles. 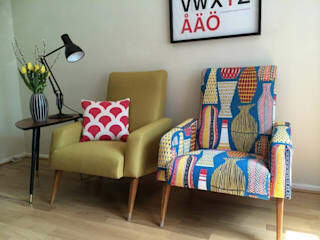 Heather is a gifted upholsterer with 15 years experience, having studied at The Traditional Upholstery Workshop, where she gained an intimate education of her craft, she combinines traditional skills with her keen eye for contemporary design and vintage influences. A self-confessed obsessive for fine detail, Heather’s bespoke work is of the highest quality. As she sources her materials from the latest trends in fabric design, to local markets and unique finds, Heather’s work is entirely individual. If you are looking for a unique piece of furniture to add a little eclectic character to your home, take a look at what Heather currently has for sale. Or if you have a cherished piece of furniture that you would like to freshen up with a new look, then take a look at the Upholstery page to find out what she can do for you.